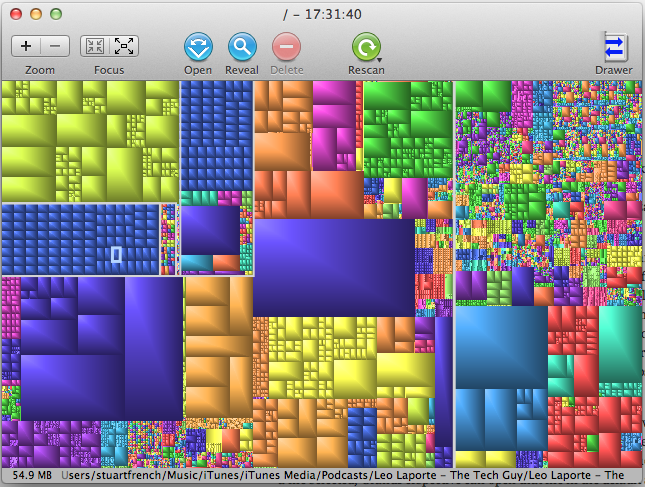 Sometimes I look at my Mac’s hard drive and wonder what is taking up so much space. After cleaning out caches, deleting apps, and searching the many of the ins and outs of my Mac’s hard drive, I still have a lot of hard drive space being taken up. I had never really used hard drive visualization tools before, but I decided to use one, and the first app that came to mind was GrandPerspective. GrandPerspective is a simple little tool that couldn’t be more straightforward. When you open the app, it asks you to select a folder or hard drive that you wish to scan. After selecting what you want scanned, GrandPerspective quickly begins scanning your hard drive for all the files and folders within your selection and how much space they are taking up. When it’s done, it displays in the files in colored and sized boxes within the window. The bigger the rectangle, the more space that particular file is taking up. Just hover over that rectangle, and in the bottom left-hand corner, the name of the file, the size, and its location on the hard drive will be displayed. The blocks are colored in groups. So that things like movies and videos that are all in the same folder or cluster are colored the same. block, you can in the “Reveal” in the top of the window to see where it is in Finder. Or if you have a file selected, GrandPerspective can open that file in the default app for that file (so Word for documents, iTunes for audio files, etc.). You can also delete those selected files, though this feature is turned off by default. It really doesn’t get any simpler than that because that is all that the app really does. My one complaint about the app is that I wish I could double-click or right-click on a block in the app and have it either show me where the file is in Finder or open in its default app. Besides that though, GrandPerspective is a really simple and helpful app for showing you visually what’s been eating up your hard drive space. GrandPerspective is made by Eriban and is available for free at http://grandperspectiv.sourceforge.net/. Donation is encouraged. If you have any questions, comments, or suggestions about this or any other topic, leave a comment below or email me at easyosx@live.com You can also check me out on Facebook, Twitter, and YouTube by hitting the buttons on the top of your screen. You can also check out my Google Plus. Thanks! Updated May 17th, 2012: Clarifying double-click or right-click for opening a file. Thanks to Erwin, the app’s maker for requesting the clarification. Thanks for featuring my app GrandPerspective. I am not sure though if I understand your complaint. You already describe the possibility to reveal or open a selected block/file. How does that differ from what you want? Sorry if I didn’t make it clear. What I really meant was I wish that if I has selected a block, that I could double-click that block or right click it and have it either open that file or it’s location in Finder. To be completely honest, I just found myself double clicking these blocks out of habit to try to get them to open, even though I knew there were the open and reveal buttons. It’s not really a big deal. I really don’t have anything to really complain about because the app works, does what it says, and does it quickly and cleanly. I just try to note both good and bad to be fair to app makers and users. I don’t want to either come across as a complete hater or fanboy of an app because I didn’t offer something I liked/didn’t like. Thanks for asking for clarification and commenting as well. I’m really surprised you found my review; I tried to find an email address or Twitter handle to let you know but I couldn’t find anything except the forum. I try to give the app makers I review some heads up and thanks for their app, but I feel right about simply posting in the forums about my review without seeming like the guy clamoring for attention. Anyway, your app is truly wonderful and helpful, and I’m glad I could review it. Since I first got the Mac, I had always heard this name in any mention of hard drive visualization software for the Mac. Thanks for commenting here too. Thanks for your reply. I can see if I can get double-clicking to map either to Reveal or Open (based on preference setting). If that works okay, it may very well become a feature in an upcoming release of the app. Yeah, my contact details are a bit difficult to find online. However, I have a Google-alert out with “GrandPerspective” as a search term. I get notified via email when anyone says anything about the app anywhere on the internet. It’s all very big brother-ish, but works very well. Anyway, once again thanks for the kind words about the app.